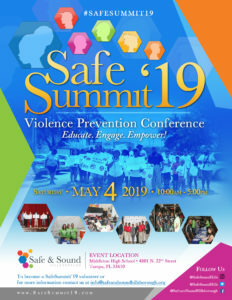 Safe & Sound Hillsborough was created in the summer of 2013 as an initiative to transform the way local policy makers address violence. This initiative shifts policy from a public safety to a public health model and aligns community and professional stakeholders to develop a comprehensive prevention and intervention approach. Our Vision Working together to build strong families, safe schools and healthy neighborhoods. Our Values Violence is preventable. Address the gaps to ensure all children and youth have nurturing and supportive families and communities. Build on strengths of youth, families, professionals and community. Promote the value of equity and ensure equal opportunities by investing resources where they will have the greatest impact and improving the infrastructure of neighborhoods where social problems have accumulated. Focus on those at risk due to exposure to child maltreatment, intimate partner violence and community violence.